Sincere dharma practitioners, over time, often feel a strong resonance with one particular deity or another, a kinship. 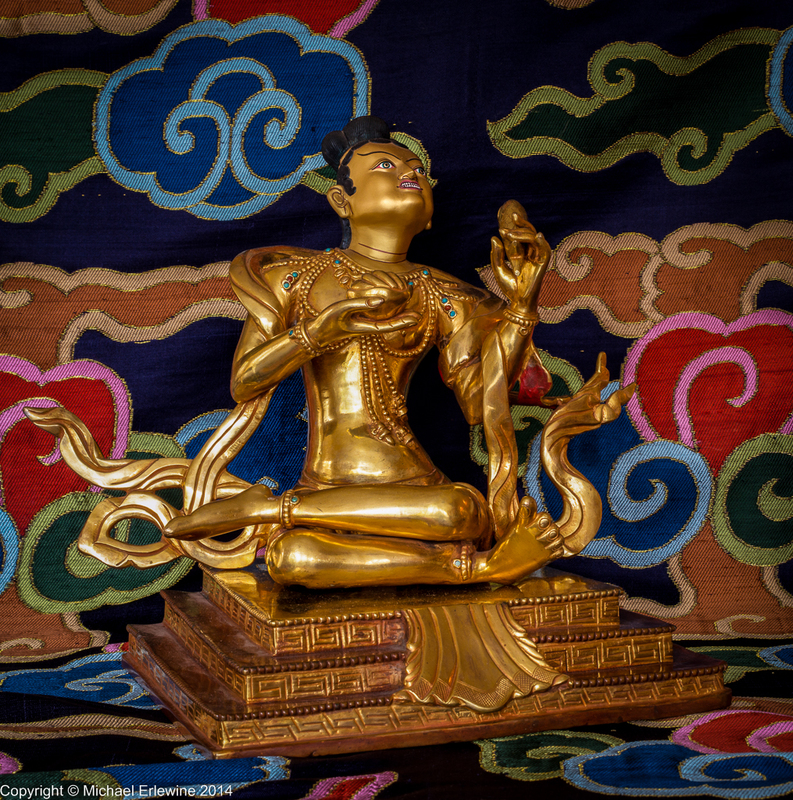 Tibetan Buddhist deities represent different qualities within us, qualities like kindness, patience, generosity, and so forth. And we don't only respond to enlightened deities, but also can resonate with particular dharmic individuals, past or present. Of course I feel a link with my main root guru Khenpo Karthar Rinpoche. He was kind enough to actually put up with me and point out how I might develop some awareness. In addition, some years ago, I also found myself in synch with a particular historical dharma figure, one of the great dharma masters from India, the Mahasiddha Tilopa, an adept who lived from 989 A.D. to 1069 A.D.
Tilopa is one of the lineage masters of the particular form of Mahamudra meditation that I practice. In fact, Tilopa was the first to receive these particular Mahamudra instructions, not from a physical teacher, but in his mind, and directly from the Buddha Vajradhara, however that works. I can't say I can explain my connection to Tilopa. It just happened some years ago after I read a particular teaching that Tilopa once gave to his main student Naropa along the Ganges River in India, which has been appropriately nicknamed the "Ganges Mahamudra." It is like a long poem, which the Tibetan monks call a "doha," literally a song of spiritual experience and achievement. This eventually led to my reading all I could find on the life and activity of Tilopa, but nothing there informed me more than that original insight connection itself. It just appeared and it still is there. Although we have various shrines at our center, including one right here in my office, I also have this statue of Tilopa placed just above the computer monitor where I work. I include a photo taken today, which depicts Tilopa sitting in bodhisattva style (legs loosely crossed) and gazing in his mind, while looking up and receiving direct instructions from Vajradhara, the very essence of the Buddha's realization. This statue, which is about 10-inches tall (and 10 pounds), was made in Patan, a city that is part of Kathmandu in Nepal. It is fashioned according to the Sakya lineage. The Sakya in Patan are famed for their artisans and in particular for statue making. Tilopa holds a human skull cup with his right hand, and a fish in his left hand. The skull cup filled with blood symbolizes, among other things, impermanence and Tilopa's mastery of death and rebirth. The fish held high in Tilopa's left hand symbolizes his ability to lift up and guide those of us who are caught in the ocean of samsara. There are also several stories about Tilopa and fish. Tilopa chose to live the life of an ordinary person. He ground sesame seeds by day, and worked in a brothel in the evening procuring clients. The Ganges Mahamudra teaching is too long to present here, and I am not fit to comment on it. Tilopa also left what are called his "Six Words of Advice," and I list the six words below. In Tibetan these are single words, but in English they are phrases. Let go of analyzing or figuring anything out. Let go of controlling or trying to make things happen.